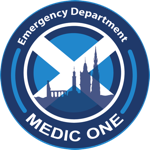 Edinburgh Emergency Medicine - NEWSFLASH! Health Hero nomination for the staff of RIE Emergency Department. Congratulations! NEWSFLASH! Health Hero nomination for the staff of RIE Emergency Department. Congratulations! Older PostAM/EM CPD day this Wednesday. See you there!